NIA-CHARLESTOWN NEVIS (April 08, 2011) — Deputy Premier and Minister responsible for Technology on Nevis Hon. Hensley Daniel, considered the handing over on Wednesday of hundreds of Hewlett Packard laptops from the Federal Government to the Nevis Island Administration for students, as a reflection of the collaborative arrangements made in recent years to transform the relations between St. Kitts and Nevis from confrontation to one of shared interests and needs. The Minister’s comments came while he received the computers for 5th Form students on Nevis from Attorney General Hon. 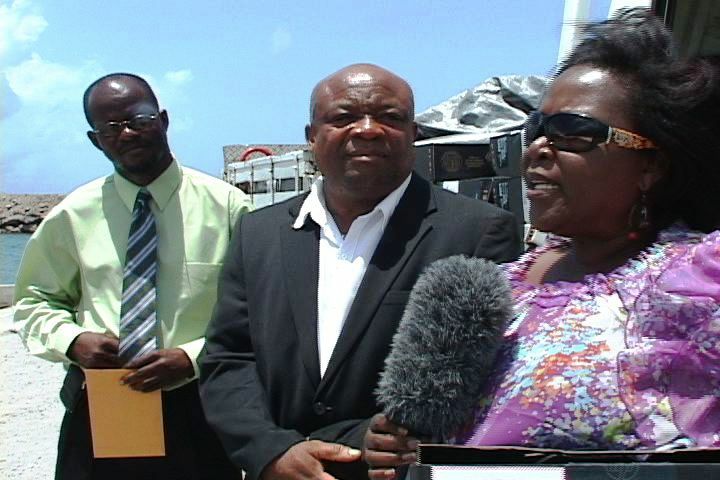 Patrice Nisbett, a Nevisian who had successfully negotiated along with Premier of Nevis Hon. Joseph Parry for the students on Nevis to receive computers from the One-to-One Laptop programme. “I want to say to the people of Nevis, that never in the history of St. Kitts and Nevis have we had a programme like this One-to-One Laptop Programme for our students and this must mean something. “This must mean that the government of the day, is looking in the direction with the young people and it must mean that the young people of the country are at one with the government and it must mean that the government is able to identify the critical issues that need to be addressed among young people,” he said. Meantime, Mr. Daniel said the receipt of the computers represented another promise made and kept by the NIA. “I am to hope that this is the kind of relationship that we seek to develop with St. Kitts and Nevis since we share common heritage, common history and common people that if there are computers available to St. Kitts those same computers are made available to Nevis,” the Technology Minister expressed. According to Mr. Daniel, the contribution of computers was significant for Nevis and they were futuristic where learning was concerned. He noted they would help to develop far deeper research among the students and could change the culture of learning in the classroom where students took greater responsibility to do research and analysis. “I am sure we all recognise that in today’s world we need the computer to assist us in so many different things and even as we seek to address matters of crime and violence, we need people who are computer literate to be able to design programmes, to be able to help us to track and mark criminals and if our students are at this stage able to use a computer and do it well, we think that we are doing the right thing. “Also, it helps to bridge the digital divide in the country and we are through these computers saying to our young people look, join with us in the Nevis Island Administration as we seek to take you forward as we take you to the information highway,” he said. The Minister was of the view that the laptops would inspire learning and would be used as an additional component to a number of existing projects in the Nevis Island Administration. The included Reading Starts With Us, the Homework Assistance and Youth Empowerment programme and Skills Training at community levels. “I expect the young people of Nevis to improve their performance in examinations. I believe that is going to be one of the goals set out by the Ministry of Education because we are satisfied that they must do it and we want it done because performance matters all the time and every time…we will ensure they will be used for the teaching learning enhancement in the classroom,” he said. The Minister urged students to care for the computers which were learning focused and research driven and to treat them as an opportunity for self development and also one to help them to succeed with their examinations. On receipt of the computers, Mrs Queeley Connor said she had accepted them on behalf of the students with a sense of pride and appreciation and lauded the efforts of the Attorney General, for what she described as his concern for the welfare of the people of Nevis. “I can only assure you Hon. Patrice Nisbett that your concern will not go unappreciated. We will ensure that these tools are used to the fullest advantage of our children. “We have now placed them on the cutting edge of technology and this is a highly competitive world and with your efforts and your help, we have been able to ensure that our children on the island of Nevis can compete with children anywhere else in the world and for that we are extremely grateful,” she said adding that the remarkable gift could only redound to the benefit of all the people on the island of Nevis.